Robynn has another yarn review for us today. This time she’s fallen for the palette of colours on offer from SweetGeorgia Yarns. Thanks Robynn! We’ve had some great yarn reviews on the blog over the last year but then it always results in in the question, “But where does one find all these great yarns Louise?”. To help answer that, I thought it would be fun to profile some of the amazing shops that I’ve come to know online or in person (or that I know so well online that it feels like I’ve been there in person!). Happily, Jessica James of Ginger Twist Studio opened her door and agreed to answer some questions – and also sent along these amazing photographs! 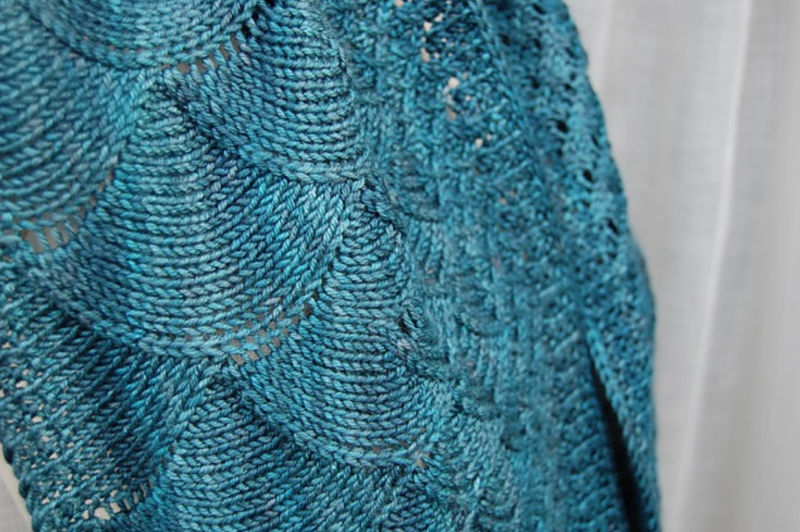 Many thanks to Robynn for writing us another wonderful yarn review of a truly wonderful yarn! Scrumptious Lace: 1,000m/1,095yds per 100g skein. Handwash only. Scrumptious 4-ply: 365m/400yds per 100g. Gentle machine wash.
Scrumptious DK: 22om/240yds per 100g. Handwash only. Single ply. Scrumptious Aran: 165m/180yds per 100g. Handwash only. Scrumptious Chunky: 120m/130yds per 100g. Handwash only. Single ply. So Scrumptious does what it says on the tin. It’s gorgeous, it’s soft, it’s lustrous, it’s very, very more-ish. Luckily for us knitters, there is more of it – in fact, with a complete range of weights on offer, there’s five times more! All shown off to great effect with the beautifully produced Scrumptious pattern collections. One quirk of the line is that, while they all share the same delicious merino/silk blend, they are not all constructed alike. Three of them are two-ply yarns, the other two singles. I tend to be a bit leery of singly-ply yarns; they are that much more prone to pilling, which is especially a worry with super-soft fibres like merino and silk, so personally I restrict my Scrumptious splourges to the plied version, which hold up pretty well for luxury yarn. And the sock-weight blend – but only that one – uses superwash merino, making it a bit easier to care for. They are however united in touchability, roundness, shine, and the spectacular, deeply saturated colour range. 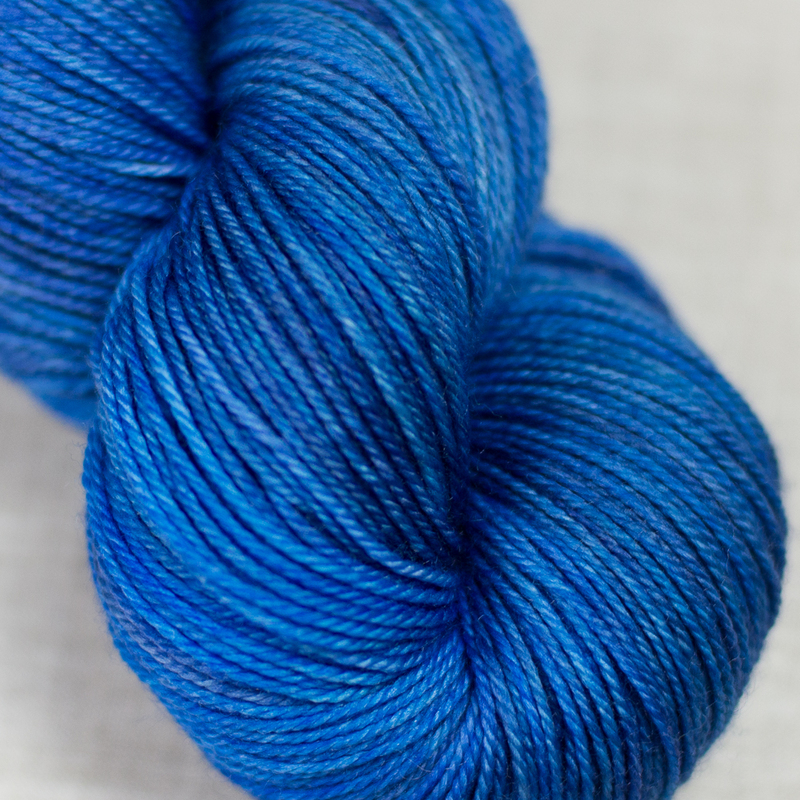 While Fyberspates’ Vivacious line is hand dyed in beautifully mottled hues, Scrumptious is all about solids. Really, really solid solids. Solids you can sink into. I’m constantly amazed at the depth of these colours – not just the amazing rich jewel tones; even softer tones such as Rose Pink and ice-blue Sugar Mouse seem noticeably more there than similar shares in other yarns. Then, too, I admire the variation in the colours available: the darker shades are complemented by a whole slew of neutrals, including no less than three greys and another three creamy or off-white tones (not including the undyed Natural). Like yellow? Choose Gold or Primrose! More a green person? Would that be plain Green, Jen’s Green, Moss, Olive, Lime, Ysolda Colours Flying Saucer – or maybe Teal? The stitch definition on the Fyberspates Scrumptious DK is truly glorious! I also have a hankering to play with the incredible Cherry Red, which would be spectacular as a Careen Capelet – thanks to the silk, Scrumptious is lustrous enough to show off textural stitches even in darker colours. And who couldn’t see themselves in a dramatic red cape!